Originally created back in 2014 by Dominic Crapuchettes, Dmitry Knorre, and Sergey Machin; the Evolution board game became a huge hit in the board game community. The board game currently stands as one of the 400 best board games of all time on Board Game Geek. While I have never had the opportunity to play the original board game, when I was presented with an opportunity to review the PC version of the game I was immediately interested. With high praise for the original game and interesting gameplay mechanics and theme, I had high expectations for Evolution: The Video Game. My only concern was that video game adaptations of board games are kind of hit or miss. Evolution: The Video Game is all you would ever want out of a digital board game, a great board game which is actually improved by the well designed digital experience. We at Geeky Hobbies would like to thank North Star Digital Studios for the review copy of Evolution: The Video Game used for this review. Other than receiving a free copy of the game to review, we at Geeky Hobbies received no other compensation for this review. Receiving the review copy for free had no impact on the content of this review or the final score. As the video game is a faithful adaptation of the board game, I am only going to go into a brief overview of how the game is played. In Evolution each player takes control of a set of species. The goal of the game is to help your species evolve and grow as they face the dangers of their environment and other carnivorous species. At the beginning of each round all of the players are dealt cards. Each player places one card in the watering hole which produces food for all of the species. Players then take turns using their cards to perform different actions. Cards can be used to grow a species’ population or body size, add special traits to a species, add additional species, and in some cases used for other special abilities. Once everyone has chosen what they want to do with their cards, it is time to eat. Players take turns having one of their species eat. Herbivores eat from the watering hole while carnivores eat one of the other species on the table. When the game ends players will score points for the amount of food they ate during the game, the population sizes of all of their species at the end of the game, and the number of cards used to give their species special abilities. The player who scores the most points wins the game. For people who have played the board game, this should sound quite familiar. That is to be expected as outside of some minor tweaks to streamline and speed up the game, Evolution: The Video Game plays exactly the same as the Evolution board game. That is not surprising as most video game adaptations of board games are basically ported versions of the board game. That makes sense as the board games that they are ported from are good in their own right and don’t need much if any tweaking. This is true for Evolution: The Video Game as it is exactly what fans of the board game should want. The game is a faithful adaptation of the board game that utilizes the abilities of a video game to support an already good board game. As this is a review of the video game port of Evolution, I am not going to get into the gameplay as much as I normally would for board game reviews. Instead I find it more valuable to discuss what the video game elements add to the experience. Before I do that though I want to quickly talk about the game itself. For those of you who have already played the board game and thus already have your own opinion of Evolution, you can skip the next four paragraphs to get right to my thoughts on what the video game experience brings to the table. People that check out my board game reviews should know that what I like most in a board game is a good combination of a game being accessible while also having enough strategy to keep the game interesting over an extended period of time. I prefer a board game that I can learn pretty quickly as I don’t want to spend more time learning how to play than actually playing the game. At the same time I want a game that has enough strategy to it where it feels like my decisions have a real impact on the game so the game remains interesting. Evolution succeeds at both as the game is straightforward enough that you can learn it pretty quickly and yet has enough strategy to keep the game interesting. What I really like about Evolution’s strategy is that there are several different ways to play the game. First you can choose between playing mostly with herbivores or carnivores. Herbivores need to mostly worry about getting enough food from the watering hole before it runs out of food. They also need to worry about protecting themselves from predators. Meanwhile controlling a predator allows you to mess with other players by eating their species. You have to worry about the other species’ size and defensive abilities though or it will be hard to get food. Generally speaking I am the type of player that likes playing the more passive role where I just build up my own things and don’t mess with other players. Therefore I usually prefer using herbivores. At times it is quite satisfying using a carnivore though to really mess with the other players. Having four different ways to play every single card also adds quite a few choices to the game. Each choice has its own benefits and negatives so you have to blend the different choices together in order to form your strategy. First you can play a card to add to the population of one of your species. Adding to a population lets you eat more food and thus score more points, but it also means you need to get the species more food or some of the species might starve. Increasing a species’ body size allows you to attack or defend against other larger species. It doesn’t directly score you any points though. Using a card to add another species can be beneficial as the more species you have at the beginning of a round, the more cards you will be dealt. Whenever you create a new species though it becomes an easy target for carnivores so you need to use cards to defend it. Finally all of the cards can add valuable special abilities to your species. This is the area where a lot of the strategy comes from. Good use of the special attributes is critical as you need to create species with complementary special abilities to beat your opponents. At first it might not look like there are a lot of different types of cards in the game, but the combinations you can create with just three different attributes gives you a lot of variety in the game. The abilities you can use in the game break down into a couple different types. First there are the carnivore cards. These cards give you different abilities that help you attack the other players. On the other end of the spectrum are the defensive cards that give you different abilities which defend against carnivore attacks. Next are the cards that help you gather additional food making it easier to feed your species. Finally there are a couple special cards that give you other special abilities. The key to doing well in Evolution: The Video Game comes down to figuring out how to combine these cards especially as some of the card effects apply to the neighboring cards. The vast number of different combinations you can make in the game gives you plenty of options to formulate your own winning strategy. This is the area where Evolution: The Video Game truly shines. So let’s talk about what the video game experience has to offer. I want to first talk about the graphical interface. The graphical interface for video game adaptations of board games can be kind of hit or miss. Some board game adaptations are just digital recreations of the board game. They are pretty bland and not much to look at. Evolution is thankfully not one of these games as it does a good job creating a good atmosphere for the game. 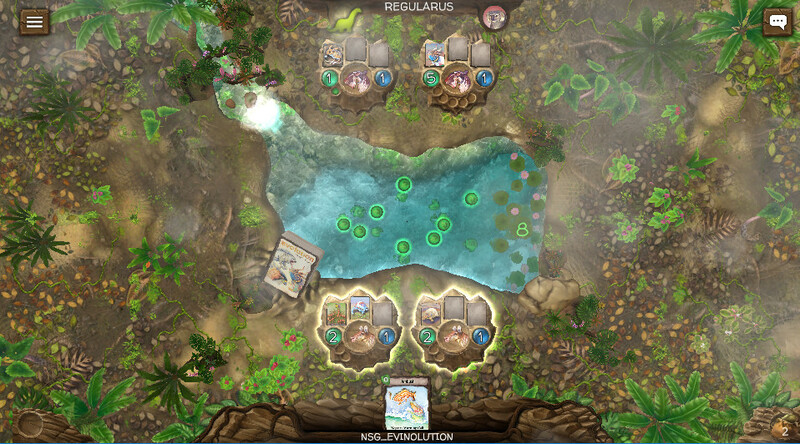 The game still utilizes the fantastic card artwork from the board game which are placed on top of a digital representation of the watering hole. The really nice thing though is that the watering hole is not static. The amount of food in the watering hole determines the amount of vegetation that shows up around the watering hole. When some of the cards are played, they can also alter the background. These don’t impact the gameplay at all but they are nice little visual additions that add to the experience. In addition to the visuals, Evolution: The Video Game’s interface really helps with the gameplay. The controls mostly utilize a drag and drop approach. To play cards you just select the card and drag it to the appropriate location. This works really well where you shouldn’t encounter any issues. You can also hover over any card and the game will zoom in on it to show you what the card does. The game does a really good job adding these little touches which makes the experience really smooth and similar to what it would be like to play the actual board game. This also extends to other little touches where the video game uses technology to improve upon the board game in some areas. I have never played the board game version so I can’t comment on how big of deal the maintenance aspect of the game is. All these issues are automatically handled in the video game adaptation though. No longer do you have to worry about how much food a species takes or how it is handed out. In addition the game handles determining what species a carnivore can attack. When choosing which species to attack, the game outlines the species that you are eligible to attack. If you are curious why you can’t attack a species, the game even tells you why if you drag the attacking species over the species you are curious about. Little additions like these are why I think Evolution: The Video Game is a fantastic video game adaptation of the board game. The good board game adaptations worry about making the game a good experience and using the technology to improve on areas that the board game couldn’t address. Evolution: The Video Game does a really good job in this area as it lets the gameplay of the board game stand on its own. The game mostly just adds little tweaks here and there which streamline the game making it quicker and eliminating the boring tasks of playing the game. So outside of visual and interface additions, the main addition to Evolution: The Video Game is the different matchmaking options. Evolution: The Video Game has basically two different matchmaking options. I am going to start with the computer AI as that is where a lot of players are likely going to start. So lets start by talking about the campaign. The campaign is basically a set of 24 different matches that have you traversing around the world. The story is very light which is to be expected from the campaign mode of a digital board game. The first seven or so levels are basically treated like an extended tutorial. People who are already familiar with the game might find this somewhat frustrating as these levels are quite easy. For people that have never played the game before, these tutorial levels are well designed. Speaking from experience having never played the game, I give the game a lot of credit for the extended tutorial. The game basically uses each level to teach you a new concept or how a couple new cards are used. Each level builds upon what is learned in the previous levels. I really like this tutorial as it slowly teaches all of the rules to the game without throwing you in the deep end with no idea of what you are supposed to do. After the tutorial levels, the game mostly has you play different types of opponents. These opponents utilize different types of strategy which end up teaching you strategies that you can implement in the game. As far as the AI itself, I would say that Evolution: The Video Game does a good job. The AI quality of board game adaptations can be kind of hit or miss. The AI’s usually have one of two settings. First they can be so easy where you have to make a colossal mistake in order to lose. On the other end of the spectrum, the AI can be so difficult where it plays almost perfectly to the point where it feels like the AI is cheating. While I haven’t tried out the hardest difficulty yet (the game has a “brutal” mode), I would say the AI does a good job giving you a challenge while not feeling like it is cheating. There are a few times when the AI tends to gang up on you though which makes it hard to win. This feels a little unfair but it doesn’t seem to happen that often. The other type of matchmaking that Evolution: The Video Game offers is online multiplayer matches. The game allows you to either play against your friends or it has a matchmaker that sets you up against players of a similar skill level. For this type of board game, I think multiplayer is always appreciated. While the AI can give you a challenge, nothing compares to playing against other human players. As the game supports cross platform multiplayer (Android, iOS, PC), there should be plenty of online competition at least at first. The multiplayer component is going to somewhat depend on how large of audience the game is able to keep. Based on the quality of the video game adaptation and the number of fans of the board game, I anticipate Evolution: The Video Game’s online multiplayer to be quite competitive and keep the game fresh for a long time. The only complaint I have with the multiplayer is that I wish the game could have offered some sort of local multiplayer. Due to the fact that players need to keep their cards secret, the game would have had to implement a mechanic where players look away from the screen when it isn’t their turn. While not ideal, I still think a local multiplayer could have worked for the game. I don’t know how hard it would have been to add to the game, but I think some players would have appreciated being able to play against another player locally without having to play on two different devices. Another small issue I had with the game is that I encountered some occasional technical glitches. Occasionally the game’s framerate would drop quite a bit but would then go back up pretty quickly. As it is a board game adaptation, this isn’t a big problem as you don’t have to make split second decisions. It is just a little annoying. In one match against the AI I also encountered an issue where the game just stopped. I was using the intelligence ability to neutralize abilities on one of the AI’s species. The game took my cards but then stopped (not locked up but just wouldn’t continue with the action I chose). The good news is that the game has an auto save feature (against the AI), so I was able to return to the menu and reload the game to restart where I left off. These bugs are quite minor and are more of an annoyance than anything else. Evolution: The Video Game is all you could really expect from a video game adaptation of a board game. The game doesn’t change the original game but instead uses the technological advantages of the video game format to streamline the board game. The game’s visual design and interface do a great job supplementing the gameplay making the game easier to play. It also allows you to forget about a lot of the maintenance elements of the board game. The game also offers challenging AI and online multiplayer which should give you plenty of challenging matches. Add this to the already great gameplay from the original board game and you get a really fun experience for fans of board games. As Evolution: The Video Game is a faithful representation of the board game, if you don’t like the board game or board games in general it probably won’t be for you. If you like the board game and want the ability to play against the computer AI and other players online, I would recommend looking into picking up the game. Also if you really like board games, Evolution: The Video Game is a great board game adaptation that I would highly recommend checking out. A great board game combining accessible gameplay with interesting strategic decisions. Does a great job adapting the board game into the video game medium. Could use a local multiplayer mode. Has some occasional technical issues.